BULLETS of light instead of the usual lead shot are being employed by Chicago’s sportsmen in a new trapshooting game. The sport, which is said to be absolutely noiseless, may be played in an ordinary hall. It is held to be a valuable aid in perfecting marksmanship. Photo-electric cells are mounted in the bodies of duck targets which move across a panelled opening at one end of the room. Each gun has its source of light which flashes on when the trigger is pressed. 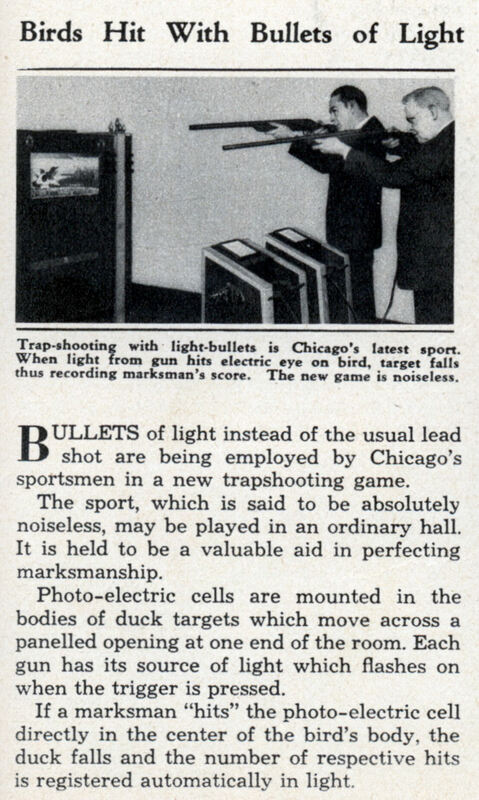 If a marksman “hits” the photo-electric cell directly in the center of the bird’s body, the duck falls and the number of respective hits is registered automatically in light. Where’s the snickering dog if you miss?